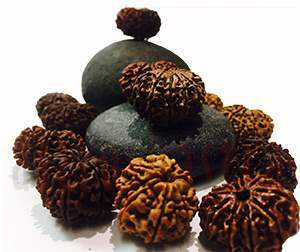 Nine Mukhi Rudraksha is ascribed to Bhairon, Yam and Kapil Muni. It should be worn on left arm for blessings of Goddess Durga, who confers energy / power that leads to wealth, family happiness, children welfare and fulfilment of ail desires. 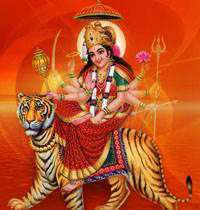 It also denotes nine forms of goddess Durga. 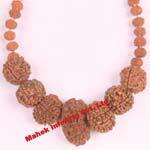 Wearer of this rudraksha enjoys wealth and family comforts. 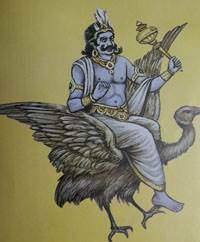 The ruling planet is Ketu which is similar in it's effects to planets like Mars. It controls malefic effects of Ketu. The malefic effects cause mental fatigue, lack of energy to materialize thoughts, failures etc. 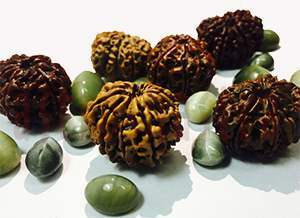 It can help amass wealth, property, assets and lead a luxurious life and help fulfill dreams and ambitions. It makes you more energised and more action oriented. Nine chambers denotes to nine form of Durga. Mother Durga is the bestower of wealth, prosperity, pleasures of family life and also she grants the boon for fulfilling all one's desires. 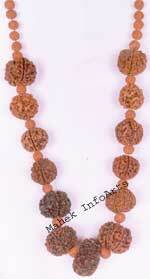 Those who wear it also obtain grace of Bhairava. They are benefited by the power of Bhairava. He obtains honour like the king of gods Indra and he also gets boon from lord Ganesha also. The wearer is freed from the fear of death. The possessor is blessed with all kinds of fame, respect and success related to spiritual progress. 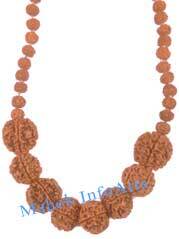 Wearing it is one of the most auspicious form of Protection and blessing of Goddess Durga. 1. It is helpful in recovery of snake bite. 2. It remove malefic effect of Ketu. 4. 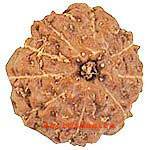 It is helpful in disease caused by malefic planet Ketu like , fever, eye pains, bowl pains and skin diseases. Ketu shows a need to renounce the lower ego, the materialistic attachment and change the previous "Samskaras" or mental impressions and tendencies, we bring from the past lives. It shows something we may have done too much on the past and now there is a need to compensate for that. It feels guilty about the personal ego and mistakes done in past. The best ways to manage its energy is by spiritual practice lke seclusion, mediattion, introspection, renunciation, study of ancient spiritual disciplines and vedanta philosphy. This is usually worn in left hand or around the neck in red thread, silver or Gold on any Monday or during the sacred occasion of Navratri to obtain blessings of mother goddess Durga. It shall be worn on Fridays or monday morning. After morning rituals, it should be washed with ganga jal or panchamruit and worshipped and worn in Gold, silver or in red thread, while facing North or east. It can be worn with any other bead. It is very effective if worn with Cat's eye gemstone, Ketu Yantra, Durga Yantra, Das Mahavidya Yantra , Bhairon Yantra silver pendant. It should be worn only after being energized by its mantras.